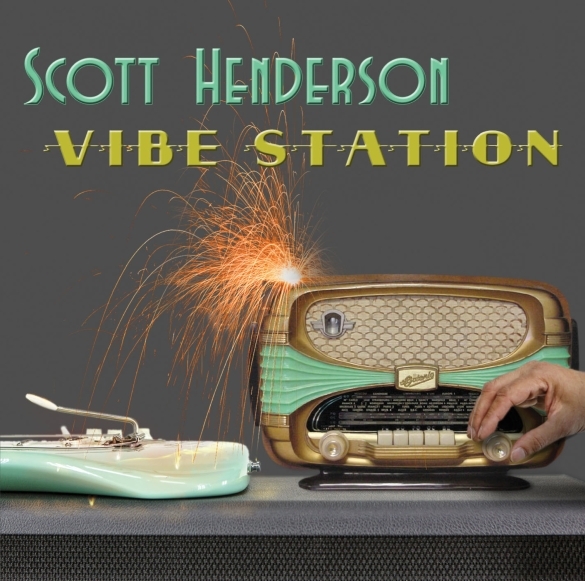 Guitar Virtuoso Scott Henderson To Release Instrumental Album For Guitar Trio “Vibe Station” on May 1, 2015! Los Angeles, CA – Guitar virtuoso Scott Henderson has finished his new album “Vibe Station”, the most ambitious project of his career! The highly anticipated instrumental album for guitar trio will be released on May 1, 2015. Scott also said that the majority of the songs are layered with multi guitar tracks, utilizing many different guitars, pedals, amps and speaker combinations, making it the most textural and versatile sounding album he’s ever done. Travis Carlton on bass and Alan Hertz on drums make this project and live show very much groove-based. Says Scott, “I need to see people moving in their seats. I’m not interested on putting on an intellectual show for musicians only. I don’t believe I need to dumb down the music to appeal to people who aren’t musicians, because when Travis and Alan play together, the groove is going to attack you whether you’re a musician or not”. Scott Henderson’s impressive work over the years as co-leader of the group TRIBAL TECH, leader of his own ground breaking trio, and sideman to some of the best jazz artists of their generation, including the great Joe Zawinul, has elevated him to the front ranks of both Jazz and Blues. Besides being a world class player and premier composer, Scott’s trademark is his beautiful tone and striking ability to blend Blues, Rock, Funk, and Jazz, creating a soulful and unique voice on the guitar. Expect to hear Scott on the top of his game on his April 2015 Europe tour. This entry was posted on Thursday, April 16th, 2015 at 22:48	and posted in Scott Henderson. You can follow any responses to this entry through the RSS 2.0 feed. « Nik Turner Debuts A Visionary New Song/Video From His Bold New Solo Album!